The Eamers married on a rainy day in November at the Brooklands Museum in Surrey. The wedding had a blue theme which fit nicely into the quirky colours and styling of the venue. There were lots of personal touches, the dress belonged to Sarah's mum, there were lego placeholders, DIY'd London buses, a Jenga guest book and even a cookie bake off complete with a batman cookie! 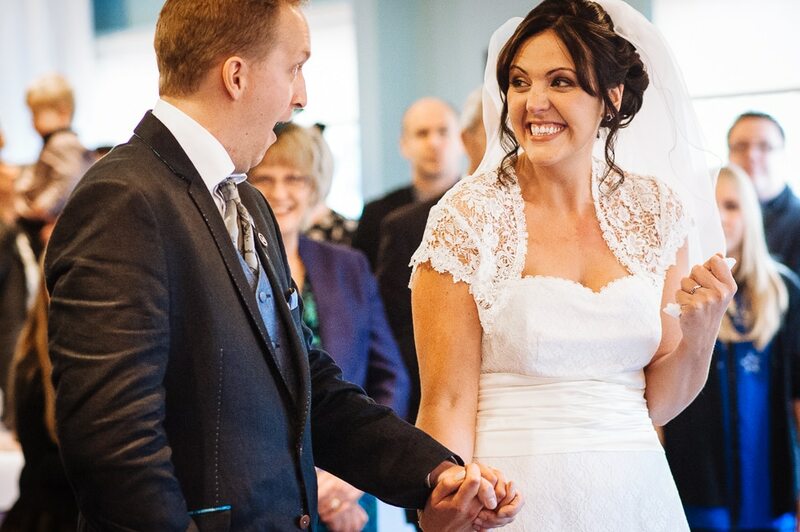 And of course, there was lots of beautiful laughter and emotion to complete the wedding! There were too many photos to choose from but I know Sarah is looking to get their wedding featured on a wedding blog so I know more will be cropping up elsewhere! This article was posted in Real Weddings, Stuff For Married-To-Be's and tagged aviation, blue, british, brooklands, bus, cars, creative, fun, fun relaxed wedding photographer, fun wedding photographer, history, hotel, jenga, lego, london, modern, modern wedding photographer, motor, museum, natural, photographer, photography, photojournalistic, planes, quirky, sport, surrey, wedding. Bookmark the permalink. Follow comments with the RSS feed for this post.Post a Comment or leave a trackback: Trackback URL. Ace Marianne – some lovely portraits too!